Though I love running, soccer and working out at home I don’t always have the time but I try really hard to make it a priority in my life. Sometimes it’s more of a priority than other things, like cleaning my house (seriously, that one can wait another day); my knitting projects that have sat around for over a year (crazy, I know) and even TV. There are days when all I want to do is curly up on our couch with the wood stove going and watch hours of TV. We got rid of our TV subscription (is that what it’s called?). Anyway, we decided that it wasn’t worth the money and cancelled it but kept our internet and phone. I’m mean, how else am I going to blog? It’s been 5 months of no television in our house and it doesn’t really bother me since I can watch a show on my computer when I have the time. Back to the point of this post…. Working out is more important to me then lazyin’ around (though I do enjoy relaxing and lazyin’ around and I’m not saying it’s a bad thing to do)….I’m just saying I choose working out over watching hours of TV. My health is important to me and so is my sanity. Sometimes parenting isn’t all it’s cracked up to be..again I love being a parent but there are days when I just NEED .. WANT… time to myself. Running, soccer, working out is time to myself, time to take care of my health, to be a better mom and wife and to keep me sane. Even if it’s only 20, 30 or 60 minutes, it’s time being active and better for me. 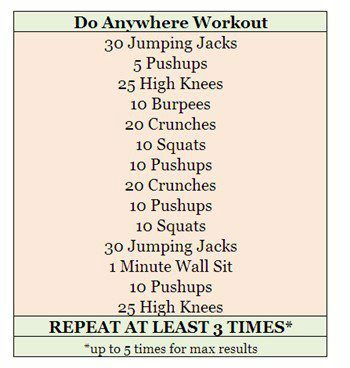 If you like watching hours of TV here is a workout you can do while you watch TV! Crazy, I know…but give it a try. And another workout for when you just want to work out not in front of the TV. From my Pinterest Workout Board via Fitfluential. Now, I’m off to do the dishes since they won’t clean themselves. I went for a 30 minute power walk this afternoon with our dog, Maclean and of course my other side kick, Hilary. Do you watch hours of TV? Is running / working out / sport / activity a priority for you? LOVE that you care more about your health than TV! Don’t get me wrong, I love me some TV, but I also believe that living a healthy lifestyle is way more important! I’ve always known that it becomes harder to find time to workout as you get older and have a family, but I got a TINY dose of it when my mom went on a business trip. It was my responsibility to cook dinner (for myself and my dad) and take care of the pets. It was hard to come home after a long day at work, motivate myself to workout, play with the animals, and then cook dinner. Props to all the healthy parents out there!